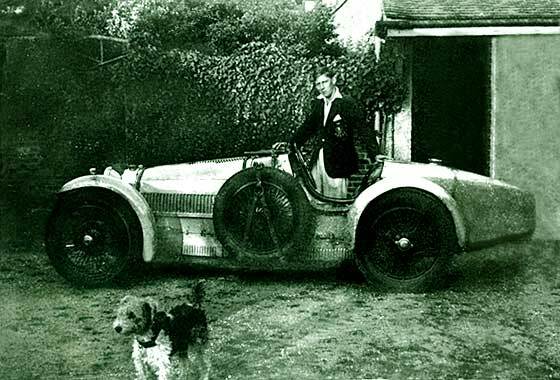 Photo of a very unusual car received from Brendan Flynn (UK) researching life of Wolverhampton artist Edwin Butler Bayliss whose family owned Bayliss Jones & Bayliss - nut and bolt makers. 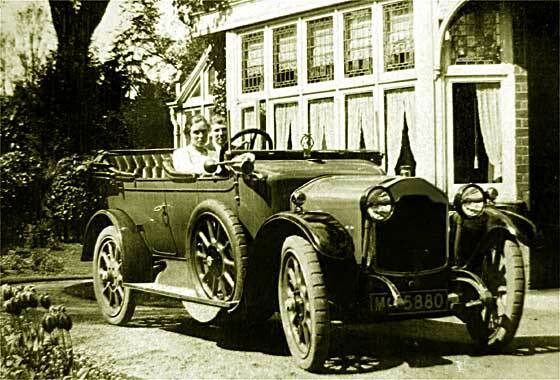 Very few pictures of the artist but the most striking shows him seated in a motor car at family home in Tettenhall, Wolverhampton. 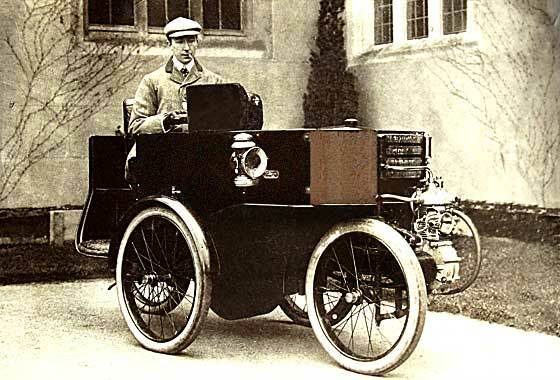 -- This is a cca 1901 Sunbeam Mabley Motor Sociable. Car was developed by John Marston who offered it to Sunbeam to avoid development costs. De Dion engine. Two photos received from Bruce Graham (UK) of paternal Grandfather in S59 which could be the 59th car in Scotland. -- Not in Scotland but 59th in Edinburgh. This is a cca 1903 Peugeot 8HP Rear Entrance Tonneau and probably issued to a car already in use pre reg. Note the front puncture repair and note wire thing dangling off rear mudguard; John Warburton advises this is an accessory designed to flick any nails out of the tyre before they got round to be pressed into the tyre case ! 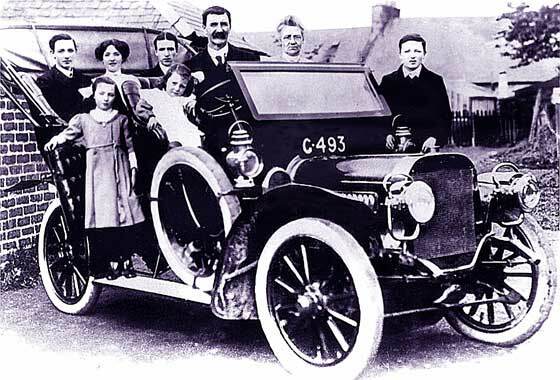 Lovely family group photo received from Alan Forsyth, Edinburgh, (UK) of Great Grandfather and family in their Argyll, taken in 1912 in Galston, Ayrshire. Can we identify the model and year of this car, and bodywork. -- C 493 is is West Riding of Yorkshire, but no dating available. North Riding had 400s at 1906/7. Specialists John Warburton and Stephen McCann agree this is a cca 1906 Argyll 14/16 Tourer. Earlier carriage name for bodywork would have been double phaeton. 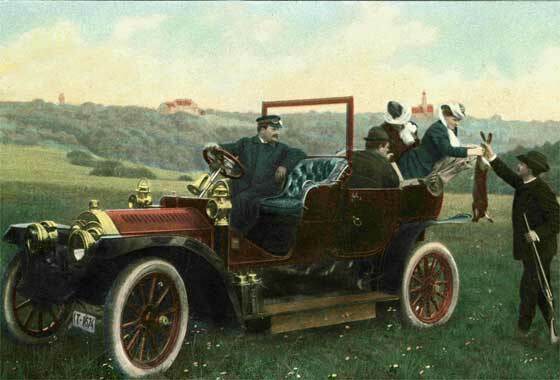 Interesting hand coloured postcard received from Tom Cosens (UK) asking if we can identify the car, possibly German. Postcards are German but he has no other background. --Very German scene, doubt British lady would handle dead hare! Not a positive identification despite two knowledgeable specialists giving same maker, a cca 1906 Benz Landaulette, because of the upper bonnet louvers, but I worry about heart shaped rad, - which they say could be reflection of lamps?? Lovely photo of a couple of cars parked in front of a magnificent villa in India received from our regular contributor John Warburton (UK). The car on the right looks like a Humber of '09. -- Smaller wheelhub and half door, so after 1906. Mudguards simply bent with no flat tops, so not after 1908/9 latest. Multiple louvers, so 1907/9. Secondary transverse spring at the back? 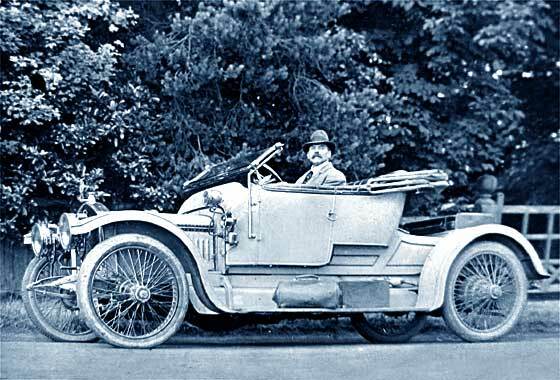 Yes, confirmed by John Tarring of Brooklands as a cca 1908 Humber 10'12 Two-Seater made in Coventry, - as he has one ! Smashing photo received from William Willey, Savannah, (USA) saying "Attached is a photo of car with stylish lady and dog. The hood ornament is a Billiken, an American charm doll. -- Doll was patented in St Louis in 1908 by Florence Pretz. 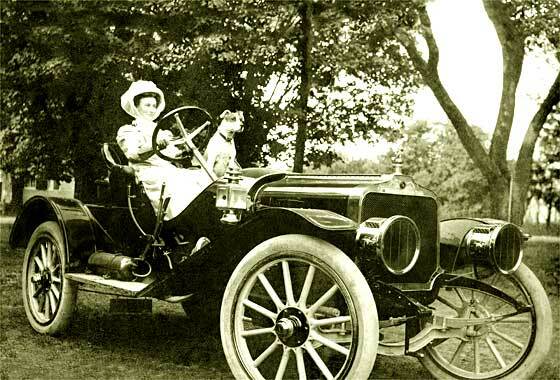 The car was made in Rochester NY by the Selden Motor Vehicle Co and is a cca 1909 Selden Model 29 Roadster. 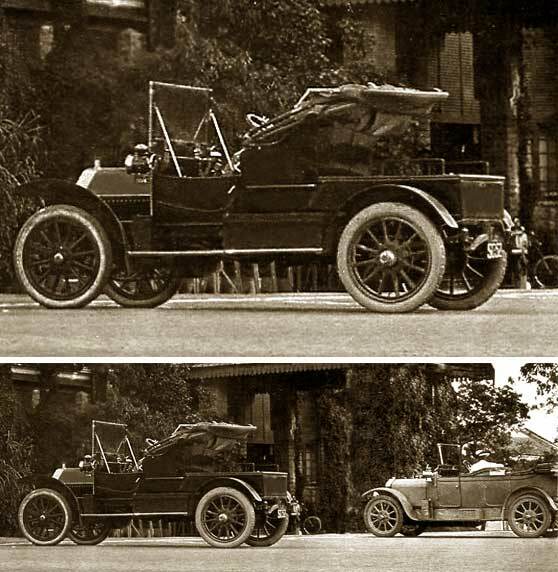 George Selden had the patent for the 'motor car' requiring royalties from all others. Ford took him on and first lost, & won in 1911. Intriguing photo received from Andrew Roxburgh (New Zealand) who had visited our site trying to identify a couple of cars owned by his grandfather who lived in North London. He found one but the other one evades him. -- Rather interesting car made by a man who started in steam commercials in 1893. 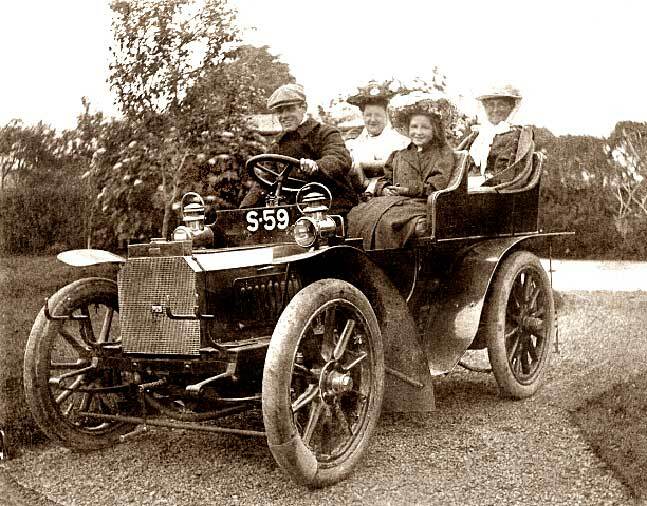 Imported petrol cars from Continent and made own Scamrock in 1907. This is a cca 1912 Straker Squire 15HP Two-Seater. Made aero engines in Bristol WW1, and stopped cars in '26. Another photo received from Andrew Roxburgh (New Zealand) who had visited our site trying to identify a cars owned by his grandfather who lived in London. This he thought was a 1913 Wolseley open tourer. -- It is indeed a Wolseley, but a cca 1912 12'16 Tourer as the registration H9378 is mid 1912 issue by the Middlesex CC. The next series, MX, commenced in July 1912. 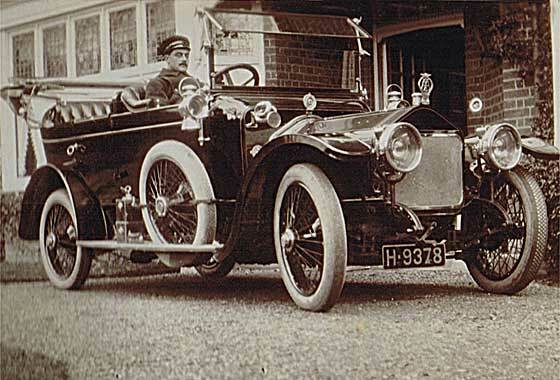 Interesting to note that the car carries both the RAC and the AA badges, the AA having the wings, so is post 1911. 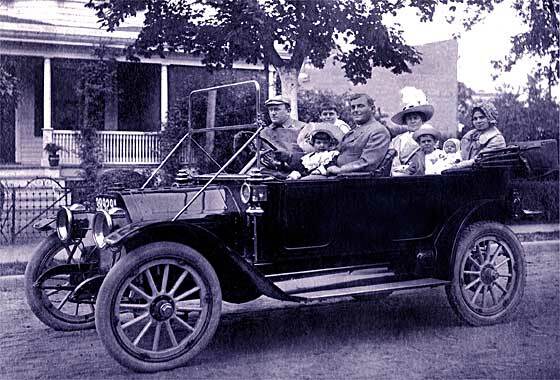 Lovely family group photo received from Richard Seymann, Virginia, (USA) saying "Some of us believe it is a 1912 Reo, but I believe steering wheel was on left side; perhaps 1911? Or maybe it's an Oldsmobile?" -- Radiator is wrong and number of wheelnuts is wrong. I don't think it is either, but an EMF/Studebaker on the changeover. Our friends at the AACA confirm that it is indeed a cca 1912 EMF Model 30 Fore-Door Touring. Very soon after, Studebaker took over and name EMF went. Another intriguing photo received from Andrew Roxburgh (New Zealand) who had visited our site trying to identify a cars owned by his grandfather who lived in London. This is another. -- The radiator top is a give-away but the lights confuse, as does the registration. We cannot fully make out the reg but many of the M# were from Middlesex, but of a date much later. Rounded mudguards so the car is a cca 1913 Rover 12 Tourer. Photo taken later as headlights and sidelights late twenties. Lovely period photo received from Mike Arlett (UK) received 27 years ago from a Dr Smith, then living in Midford, just to the south of Bath. The photograph will be in Mike's book on history of railways in the village. Photo dates from (circa)1913 and is said to feature the Harbutt family. Harbutt was the inventor of Plasticine and lived at Bathampton. 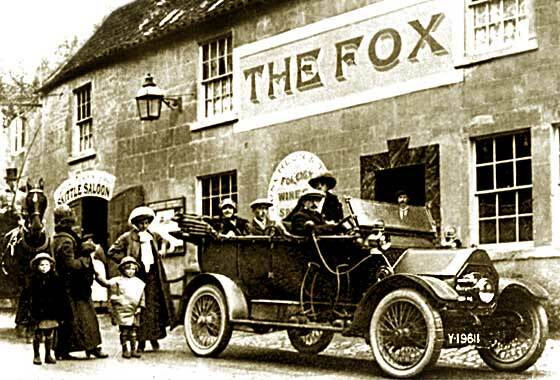 The Fox Inn closed before WW2.-- Car carries mid 1913 Somerset CC registration and is a 1913 Belsize Torpedo, probably the 14'16 5 Seater. Lovely photo of a couple of cars parked in front of a magnificent villa in India received from our regular contributor John Warburton (UK). 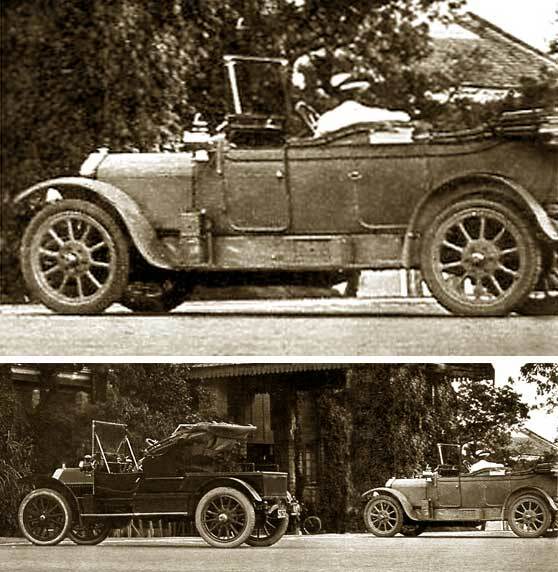 The car on the right looks like a Rover 12 of 1915. -- Concerns on the Rover are about the bulky windscreen and not being able to see the profile of the bulkhead, obscured by the oil sidelight. Bonnet handle and catch very much Rover as is general position of lamps. Mudguards bulkier with overhang, so poss earlier making it a cca 1913 Rover 12HP Tourer. 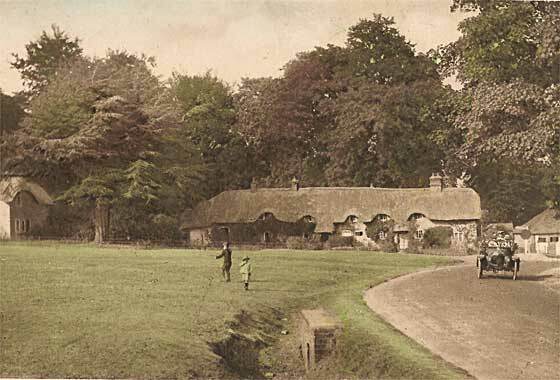 Lovely postcard village scene received from Sue Harvey (UK) of her grandparents' thatched cottage with some of their children playing on the green. Could we date the car to date the kids. Photo perhaps 1914/5 or 1918/9. -- Much too small to read the numberpate or name the car. Bullnose rad so build year pre WW1 say 1913-15. Photo after that. Not Morris, MG, Star, AC or Lagonda. Possibly Alldays & Onions or Enfield Nimble 9. If French, possibly Alba, Le Zebre, Motobloc, or Unic. 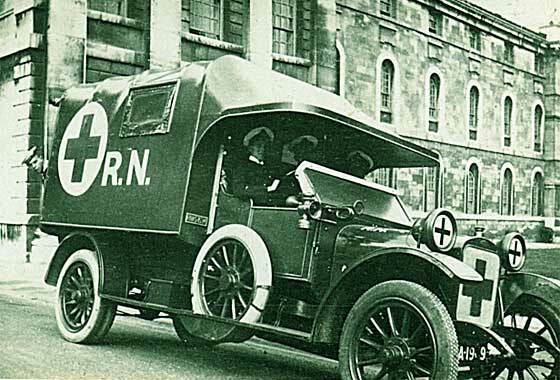 Photo of an Ambulance marked 'at Greeewich' received from Jon Bailey (New Zealand) which was found in a relative's family album. Can we tell him the Make and model? 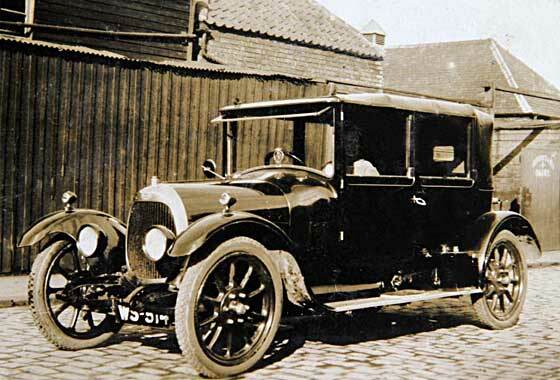 -- This is a cca 1915 Sunbeam 16HP Ambulance which was actually made by the Rover Car Company. After outbreak of W War 1 the UK Ministry of Munitions ordered Sunbeam, who had been making aero engines, to concentrate solely on war work involving aircraft, and so a licence was given to Rover to produce them. In the process of looking for a photo, visited site Edinphoto run by Peter Stubbs (UK) where they have thousands of photos relating to Edinburgh life in all its aspects, where I came across a photo of a car they were trying to identify. -- Very pretty radiator indicates a cca 1920 Angus Sanderson 14HP Closed Tourer. Registration WS 514 is a Leith Borough Council issue and ended with 520 in November, becoming Burgh of Edinburgh. This range of cars was made in Hendon, Middlesex. Fuzzy small photofrom Roy Edgar (UK) who heard of us via the 'Who Do You Think You Are' Genealogy Exhibition at London Olympia. -- Rescan and additional photos now make identification relatively simple. Ally bonnet, five louvers, and reg BU 1241 say this is an Oldham CBC registered 1920 Vauxhall Type D Tourer; Vauxhalls mainstay during and immediately after WW1 being frequent army staff car. Derived from the famous Prince Henry, followed by E. Wheel trims are after-market. Puzzling photo received from Mario Lacroix, Quebec (Canada) taken in Quebec 1927. Can't read name on the radiator; is it a Bentall? -- Same photo elsewhere on the web saying taken by Lake Geneva, Switzerland? Not a Bentall. None of the usual suspects with round rads because rad is pointed & two word name. Long overhang to front mudguards. Number of Experts including John Warburton agree this is a cca 1924 Delaunay Belleville Landaulette updated later with spots,bumper and disc wheels. Puzzling photo received from James Osbourne (UK) found in his Grandmothers estate featuring his Grandfather in the early 1930's. Mention in document of a 'YR7580 in Suffolk.' --YR is London CC, and car is a Bugatti. Specialist John Stavely says bonnet, scuttle and tail all non-standard; bonnet slopes up and scuttle same line. Filler too far back, and rear two vents missing. 37 or 35A special! Bugatti OC Ian Patton also says T37. No trace YR 7580, but 8 Bugs known with YR reg. Photo received from Luigi Perini (USA) saying "find a partial photo of an automobile. The resolution is not great. The photo was taken in Hagerstown Maryland. Can you identify the year and make? The year is more important." -- Always very difficult to identify cars from the rear but this is even more difficult because the photo is very small, pixly and blurred. Distinguishing marks are two body lines across the back and six wheel nuts on spare. Our Mark Dawber thinks this is a cca 1925/6 Nash. 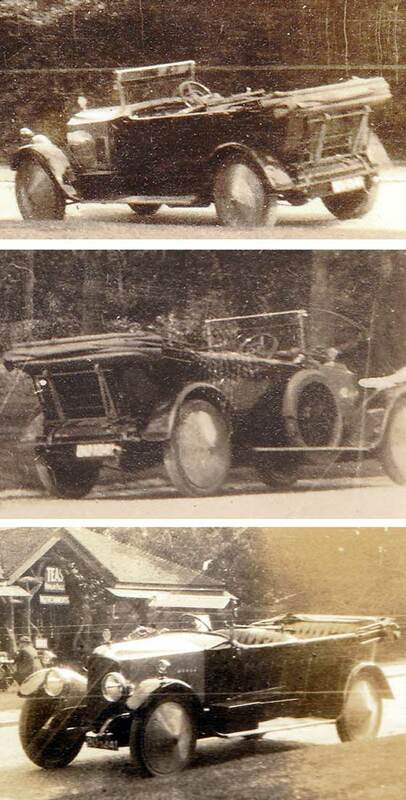 Another photo of a relatively unusual car received from Jonathan Day ( USA ) which he is trying to identify. No background info received on the car or photo. -- Not an easy one to identify. 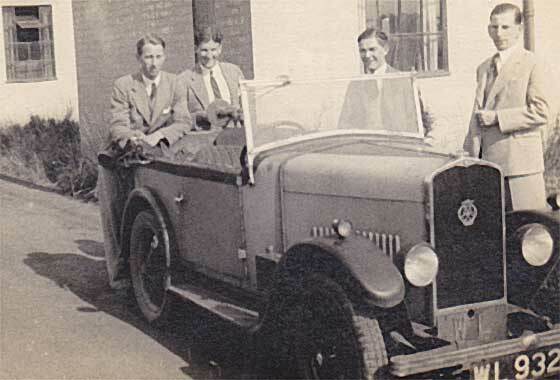 We thought it was a cca 1929 Swift 10HP but our John Warburton, whose dad would not let him have one in the 1950s when he desperately wanted one, is more than positive that it is a cca 1929'1930 Triumph Super Seven a two-door four seat open tourer. Low lights & no light bar so one of the earlier models. Photo received from Joao Ferreira (Portugal) showing two local famous actresses in a pageant at the circuit of Campo Grande in Lisbon. -- Not an easy one but spotted by our John Warburton and Mark Dawber as a cca 1929 Windsor White Prince Roadster. The Windsor was made in St Louis, Missouri, USA, by the Moon Company wo started in 1905. Also made the Dianna car and in 1929 changed the name to Windsor using the UK's Prince of Wales in their ads. Also Ruxton, but all gone by 1930. 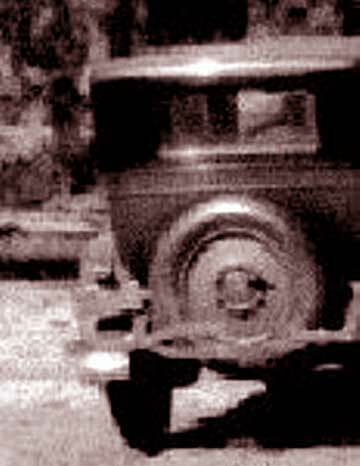 Blurry photo of a relatively unusual car received from Jonathan Day ( USA ) which he is trying to identify. 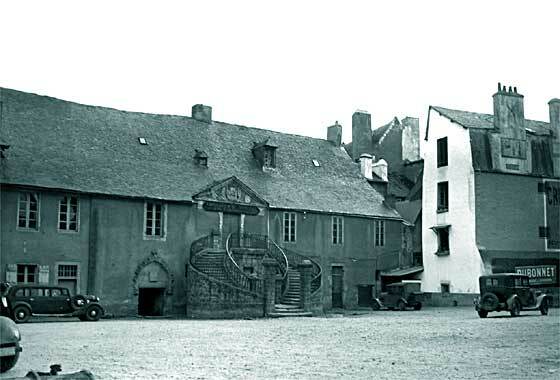 Car is from a photograph taken in France and possibly post-war. 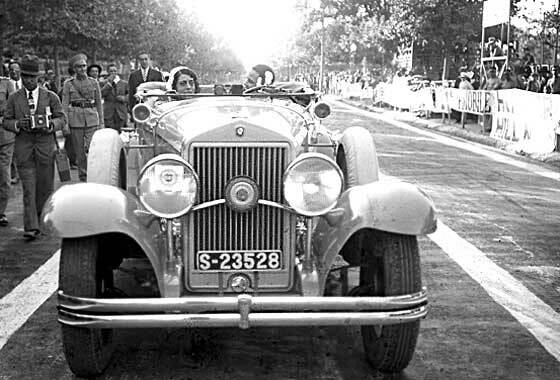 The car is very interesting in itself, but is also crucial to the understanding of other photos. -- This is indeed a French car, influenced by the Traction. Relatively sure that this is a cca 1934 Renault Vivastella; a low waistline, lights a la Traction, multiple horizontal bonnet louvres, correct doors, running boards, wheels ... etc. Photo received from Georgia (Canada) who is trying to identify an old car in a family photo. 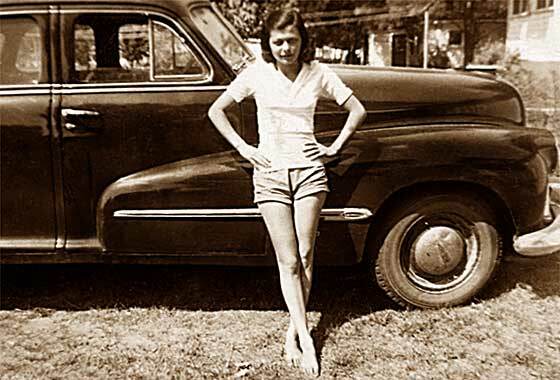 The subject is her mother and the family car, which she think was taken some time in the 1940s. Dating the car will help her figure out the age of her mother in the photo. --Wing bulge extending through the door; stripe has a small oval badge on the wing; wheelhub badge. A General Motors vehicle post WW2. Confirmed by our friends at AACA that the car is a cca 1946 Oldsmobile, an Ace 66 Sedan. In response to the unidentified Trailer photo below, we received photos from Craig Gillingham (Australia) of similar remains behind a museum in Australia, suggesting perhaps a Renault or Unic. He later followed up his email with another saying he did more research and believes both could be from a British Armstrong Siddeley. -- The solid double section wheel certainly looks the part. 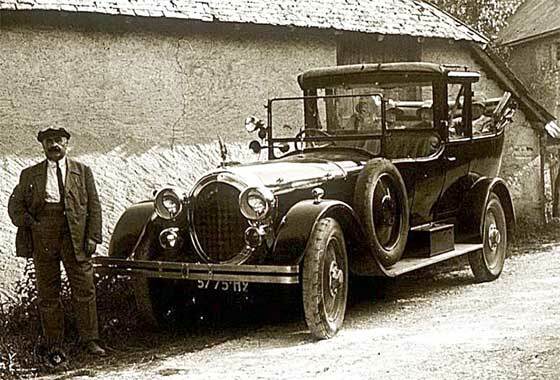 Our Siddeley expert Simon Pearce pondered and agrees both could indeed be mid 1920s Armstrong Siddeley 14 HP. 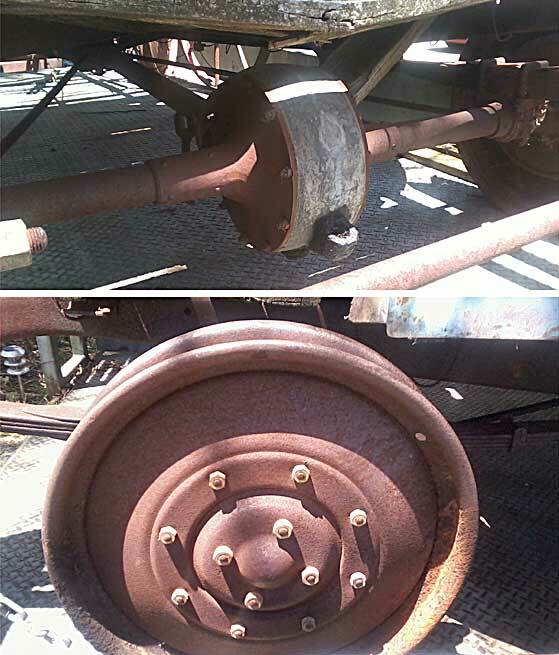 Couple of photos received from Nigel Rose (Australia) saying please find attached pics of a chassis found on a farm in Australia. Am trying to find out info about it. Any idea of what it may be would be great. Thanks. -- We regret this enquiry is a little bit too specialised for us. Our knowledge base relates mainly to the general overall veteran and vintage car scene, but regretfully not commercials and not always in detail. Now believed remains of a mid 1920s Armstrong Siddeley 14.